Unicorn & My Little Pony Parties For Kids | No.1 Unicorn Entertainers! What child wouldn’t love to party with their favourite My Little Pony or Unicorn character? 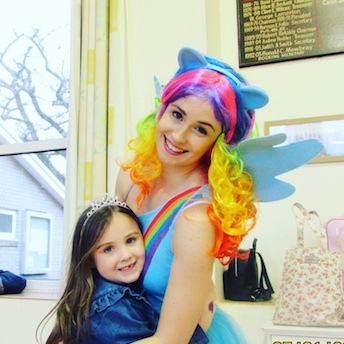 Whether it’s a Unicorn or My Little Pony Equestria Girl, we will bring your child’s favourite character to life in a party that they will never forget! All our entertainers come from a singing, dancing or performance background to ensure that your child’s party is unforgettable. If your little one is just crazy about My Little Pony and Unicorns, they will love to have their favourite character hosting a personalised party just for them. Favourite characters include: Unicorn, Twilight Sparkle, Applejack, Rainbow Dash or Pinkie Pie. Your party guests will be thrilled to see their favourite character greet them as they arrive. They’ll be no time to waste though, as an energetic, fun-packed party awaits! We’ll involve everyone throughout the whole party, with lots of interactive games, music and activities. Parties will be tailored to your chosen character, whether it’s a Unicorn or My Little Pony. The party will be jam packed with interactive games tailored to your chosen character. This includes The Rainbow Catapult: where the children have to catch beanbags catapulted into the air. Songs and games will be tailored to your child’s character of choice; the Equestria Girls theme tune is a particular favourite for My Little Pony lovers! What is a party without lots of pictures to remember it by? Your guests will have amply opportunity to pose for photos before singing happy birthday and digging into some delicious cake, all before the magical birthday wish. Your entertainer will arrive 30 minutes before your party and will bring everything necessary for a fun-filled time, including all the games, music, pass the parcel and prizes. View our phenomenal testimonials to see what other parents thought about their party, and book yours today! Is there a limit on the number of children? We allow up to 30 children per an entertainer – you may need a second entertainer if you think over 30 maybe present. Locations: We provide My Little Pony and Unicorn Parties all across the UK. Our party locations include: London, Kent, Surrey, Essex, Berkshire, Buckinghamshire, Bristol, Hampshire, Manchester, Liverpool, Leeds, Birmingham, Coventry, Nottingham, Southampton, Bournemouth, Leicestershire, South Wales, Cardiff, Newport, Scotland, Glasgow and Edinburgh. Visit our location page to find out more. Disclaimer: We do not wish to violate or infringe upon any copyright laws. We DO NOT claim to be associated with any copyrighted or name brand character. Our characters are based our imaginations. Any resemblance between our entertainers and any copyrighted characters is purely coincidental. All clients booking us must be in acceptance that our characters do not represent any licensed copyrighted characters or their stories.